Possums are familiar to many Australians, often taking up residence in our gardens and homes. 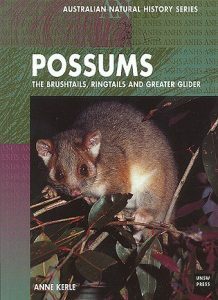 It is the Common Brushtail Possum, the most abundant and widespread species, which most people know, but this is the first book devoted to describing the natural history of the ‘larger’ possums of Australia, the 13 species belonging to the Brushtail and Ringtail families, including the Greater Glider and the Cuscus. University of New South Wales Press, 2001. Octavo, 156 pages, paperback, colour photographs. Artist/Author: Wilson, Don E. and Russell A. Mittermeier, editors. Platypus, Echidnas, Opossums, Kangaroos, Koalas, Wallabies, and Wombats – Monotremes and Marsupials include a host of animals that have intrigued mammal fanciers for centuries. Monotremes are a very distinctive ancient group of mammals with only a handful of extant species in Australia and New Guinea, and Marsupials, with roots in South America, likely reached Australia via Antarctica some 50 million years ago. With relatives remaining in America, Marsupials have adapted to an amazing diversity of lifestyles and habitats. 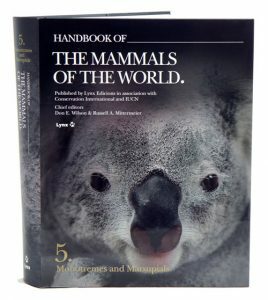 Volume 5 of HMW provides complete coverage of these two important groups of mammals. Lavishly illustrated with color photographs showing different behaviors of all of them, the text contains the latest up-to-date information on all families of Monotremes and Marsupials, both Australasian and American. 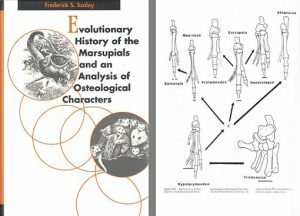 Evolutionary history of the marsupials and an analysis of osteological characters. This title is not held in stock but we are happy to supply on special order. Please contact us. 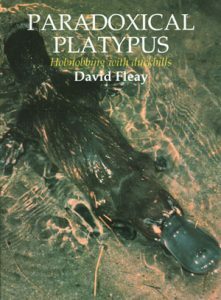 Paradoxical Platypus: hobnobbing with duckbills. A reprint of David Fleay’s classic work.